2012 is a busy year for Canada’s Dan Snaith. As always, multiple projects are on the go all at once, from remixing artists and setting up his own label to touring with Radiohead and creating his new dance project of Daphni. The debut album is entitled ‘Jiaolong’ (pronounced JOW-long) and it is indeed, dance music that truly liberates, surprises and innovates the listener. Dan Snaith has a body of shape shifting works behind him, under the moniker of Caribou, and it is here that I was first introduced to the prolific and innovative artist, that is Dan Snaith. Late night television was where Dan Snaith’s music first appeared to me, over a decade ago. ‘No Disco’ was the coolest TV program around, where Leagues O’ Toole introduced independent music videos covering all genres and styles. An hour of true inspiration was broadcast from the TV screen each week. One night, the video of ‘Jacknuggeted’ by Manitoba (as Dan Snaith was known then, before a court case ensued that meant he changed the name to ‘Caribou’) was shown. I was immediately transported to this bubble of lovingly warm electronica infused indie music, which was termed ‘indietronica’. The singular song of ‘Jacknuggeted’ meant so much to me. The open, beautiful lyrics. The haze of psych pop wonder over the course of three minutes. The gorgeous acoustic guitar strum that breathed such life into my mind. Of course, the video was otherworldly and beautiful, which was made by the cool Dell 9. A wealth of honesty and simplicity was etched across the autumnal woodland setting. The music matches the video note-perfectly. The climax in the song is building as a ball is thrown into the air. As the ball falls, colours of red, blue, orange, yellow are splashed across the woodland. Bright sun shines through the leaves and trees. The scene and music was utterly transcendent to me. My perfect introduction to the world of Caribou. The song’s lyrics of “I met you then fell apart/ now I’m nothing more than a broken heart’ evoked, like the video, a spectrum of colours of emotion. Days later, I picked up ‘Up In Flames’, the album in which that song ‘Jacknuggeted’ could be found. The album’s euphoric sound blew me away, with songs like ‘Hendrix And Co.’, ‘Twins’ and ‘Kid You’ll Move Mountains’, Dan Snaith quickly became an indispensable part of my music collection. His follow-up albums ‘Milk Of Human Kindness’, ‘Andorra’ and 2010’s masterpiece ‘Swim’ today, are all forged heavily into my brain and consciousness from the endless re-visitings. Forward to 2012, Dan Snaith remains as prolific as ever. Caribou have been supporting Radiohead on their world tour throughout the summer months. In between, Dan Snaith DJs during the moonlight hours across various cities worldwide. Last year, the first glimpses of Daphni surfaced with the release of the Daphni 7” single ‘Ye Ye’, on Four Tet’s Text Records imprint, which is featured on the debut album. Like his close friend, Kieren Hebdon (Four Tet), Snaith set up his own label Jiaolong. A string of Daphni remixes were soon released, from the likes of California’s Emeralds and Junior Boys to remixes for Carl Craig and Hot Chip. Earlier in October saw Daphni release his highly anticipated debut album ‘Jiaolong’ and it most certainly delivers on every level. The nine tracks are utterly compelling dance odysseys ideal for both the dancefloors and headphones. The music of Daphni was constructed with a modular synthesizer designed by Snaith himself and it is this instrument that’s central throughout each of the nine cuts. Unlike Caribou where Snaith combines multiple layers and textures of maximum sound, Daphni focuses on minimalism, where acoustic and synthetic elements converge. 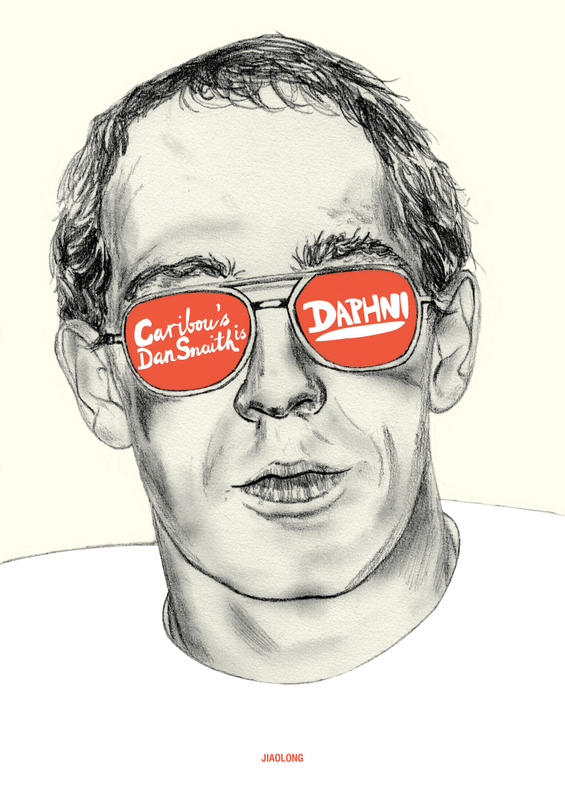 Interestingly some of the album’s tracks were worked on by Snaith during the making of ‘Swim'(Caribou’s last creation) and elements of ‘Swim’ can be heard in Daphni’s techno explorations. ‘Yes, I Know’ opens ‘Jiaolong’ and what an instant classic it is. Soul, funk collides with dance music so effortlessly. Snaith uses an old soul classic to create a fully charged and uplifting funk infused dance cut. The masterful soul of Buddy Miles and ‘The Segment'(taken from 1970’s ‘A Message To The People’) is sampled over the pulsing synths and infectious beats. “Yes, I know she told me so” is sung in refrain by Miles that’s got irresistible soul and funk. The outro refrain of “She’s got to move my soul” brings the song to a close, complete with divine brass and compelling beats. What comes next is possibly the best dance track of 2012. Daphni remixes obscure Togolese band Cos-Ber-Zam’s ‘Ne Noya’ with stunning results. Think Congotronics, Sun Ra and Caribou material distilled into a five-minute sonic exploration. A hypnotic groove drives the song, all happening at a slow pace. Afrobeat of drums and percussion fuse with spiritual realms of African chants with a thudding bassline and swirling synths. A further recommendation is to check out Analog Africa for more rarities of this kind! bleeps and percussion. ‘Pairs’ is sublime. Brazilian tropicalia permeates the pulsing synths and rhythmic grooves. Elements of ‘Odessa’ from ‘Swim’ can be heard in the headspace of ‘Pairs’, in between the synthesizer and stunning hooks. ‘Ahora’ is one of my favourites. The track echoes Caribou’s ‘Found Out’ from ‘Swim’ and is indeed a compelling venture in synthesizer sound. An ethereal dreamscape of sound is embedded in a floating ambient psych haze. The rough and spontaneous traits to the Daphni moniker is shown here, as the synthesizer loops in this beautiful dreamy haze. Another highlight is the exceptional ‘Jiao’, which is an explosion of cosmic and euphoric sounds. A hypnotic electric guitar groove is the bloodflow of the track that’s highly infectious. A cosmic space of layered percussion, trance beats and cosmic guitars creates a haven of free jazz, afro beat and dance sounds. I think ‘Jiao’ is the album’s climax where Daphni is no longer constrained, allowing a stream of energy to burst from the tape desks. Think Tortoise remixed by Four Tet. ‘Springs’ is house/techno with vocal loops. Drums enter the mix three minutes in that is reminiscent of Four Tet’s trademark sound. The album closer ‘Long’ could be the finest of Daphni’s works. Shoegaze and blissed out electronica combine to form a beautiful noisescape that builds and evolves into a true tour-de-force. This song epitomises Snaith’s aim for dance music to live up to its potential “to liberate, surprise and innovate.” Here, on ‘Long’, Snaith fully delivers on this. Innovative layers of synths gloriously float through My Bloody Valentine-esque noise that recalls the recent works of Emeralds and Oneohtrix Point Never. Amazing. Daphni is yet another compelling chapter in Snaith’s rich body of innovative work. I look forward in huge anticipation to more Daphni and Caribou releases in the near future. ‘Jiaolong’ shows Snaith’s masterful artistry in full flow. But with Caribou’s plethora of releases, we’ve come accustomed to this fact. Snaith has said “DJs have the potential to blindside you” and in his Daphni guise, Snaith has done just that. ‘Jiaolong’ is out now on Jiaolong.